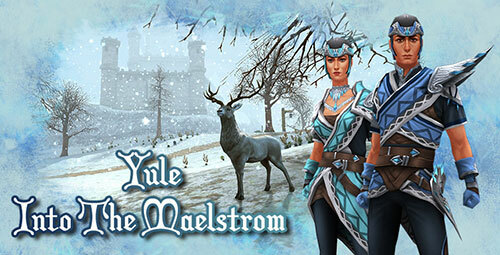 This year's Yule event - Into The Maelstrom, is now available on both iOS and Android. Join now and experience the snow in Lir's Reach! •	Defeat Monolith’s of the Maelstrom for impressive cold dealing Frostiron weapons or Frostiron rings and bracelets designed to enhance each class. •	Visit Kennis of the Snow in Farcrag Castle to take the top hat quest chain and hunt for presents across the zones, with a fantastic selection of ten hats to collect and the chance of rare star dust varieties every time you hand the quest in. •	Eight festive crackers have been hidden across the zones which can be sold for up to 50,000 gold. •	Take part in the daily quest to fight the powerful minions of Taranis. Jack Frost instructs you to find your enemies in Lir’s Reach, Fingal’s Cave or Carrowmore Tunnels as you quest for experience to help upgrade and enhance your character. •	Eight, brand new, animated mounts can be purchased from Dolina of Glenmor. Each boosts your movement but the greater ones do health and energy regeneration and the very best have special attacks designed specifically for them. •	Meet Serena of the Ice in Farcrag Castle. Battle grim sprites across the land to gather Winterheart crystals for her and hand them in to get one of twenty Winterstaves.